I know I said it last time (and every time?) but holy crap, race day is tomorrow! I’m a wreck, as usual. Woke up this morning and thought maybe I tweaked my achilles. Even though I haven’t really been running….and there’s no run in an Aqua Bike…..so why am I worried about this? I also became concerned that I had a cold, and then thought maybe I broke my pelvis. Yeah….the pre-race jitters are in full swing. To-do lists and packing and alarm setting, and omg breakfast, etc etc etc. My brain is in overdrive, and I kind of love it. Setting goals has been really awful this whole season. Actually, the goals themselves haven’t been awful, its been the expectations that are out of control. The ones that live inside my head, and never make it to the page, but nevertheless are driving me. And not in the “reach for the moon and land among the stars” kind of way. More of a, “hey, you’ve got a CSS of 2:20/100m and a Zone 2 bike speed of 12mph, so you should podium in your division,” level of ridiculousness. Like, what?! Who thinks that way? I have no idea why I put that kind of stupid pressure on myself. So to fix that, my goals need to look different. Smaller, more concrete, and within my power to execute. 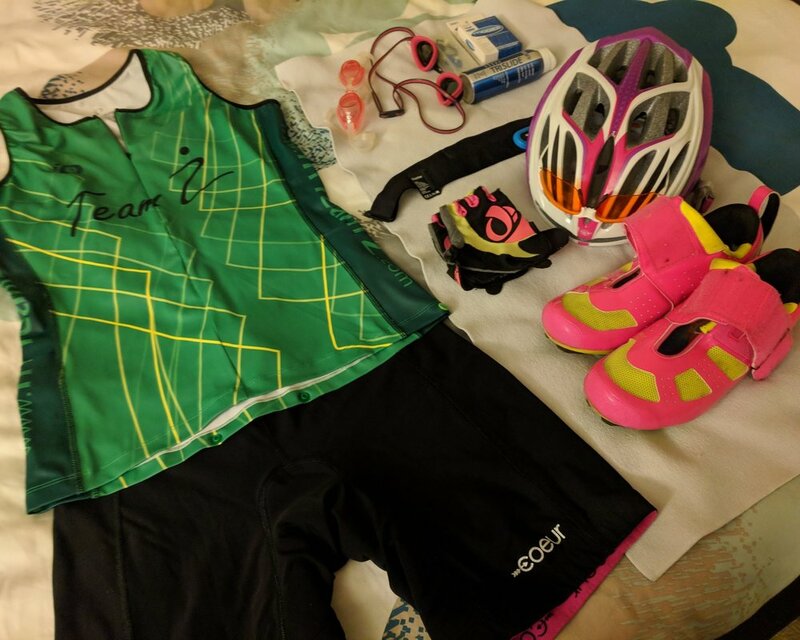 Less stuff than for a triathlon….but not by much! The water temperature is 70 degrees, and the amazing Jen is letting me borrow her old wetsuit. I’ve only swam in a wetsuit once before, so the idea is to take the start easy and keep everything long and lean and relaxed. No panic, no fuss, just swim. Second swim goal: don’t wish it away. The Williamsburg swim was choppy, and at one point I just wanted out of the water. No matter what happens out there tomorrow, I want to grab it and live, not wish for it to be something else. I’ve got a fairly flat course and no run. What have I got to lose? I will hydrate like a champ (still haven’t graduated to grabbing water bottles yet, so hydration pack it is) and then I’m going to break the race up into 5 mile chunks, and try to get a little bit faster with each chunk. I’m just not even going to go there. If I finish and can say I reached my three goals, then this race is going to be the biggest win, worthy of nothing but smiles. Let’s do this! Anyone else racing this weekend? Shout out to my Manatee peeps at IMChatt! Technically Luray Swim Fest is billed as a race, but I'm treating it like a super fun training day, with a medal at the end. After an effort to ride bikes with Liz was thwarted by rain, she mentioned Luray Swim Fest. I had originally been planning to do Washington's Crossing again this year, since I really enjoyed it in 2017, but the weather wasn't looking too promising. Instead, I signed up for the 2250m event at Luray, and I'm really happy about that choice. Me at Washington's crossing 2017, where you swim across the potomac river. With bonus image of the elusive J in the bottom right corner! In addition to this being a bit of a girl's day out with friends, this event also has a Team Z presence. I want to spend some time at the tent, and try to stop being such an outsider. I want to really swim, and finish strong. I want to finish feeling good enough that I can run out of the lake and across the finish. I've done some distances pretty similar to this before, but nothing exact. So....automatic PR, I guess. Who else is swimming this weekend?